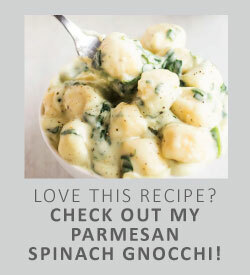 This easy weeknight recipe is sure to be a hit! 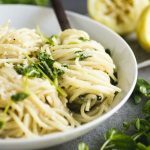 Fresh spring pea shoots, spaghetti noodles, and a simple lemon sauce with pepper and parmesan cheese pack this pasta recipe with a ton of flavor. Ready in 30 minutes. 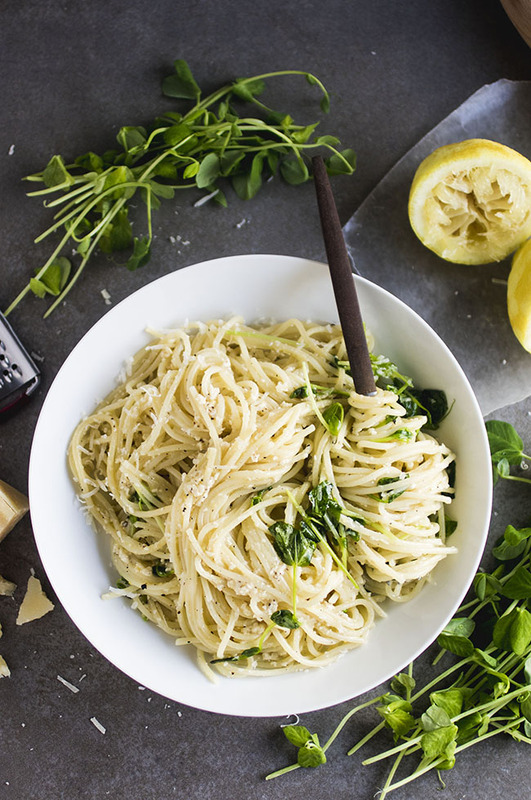 This simple lemon pasta tastes like springtime just slapped you right in the face. (But, like, in a GOOD way). 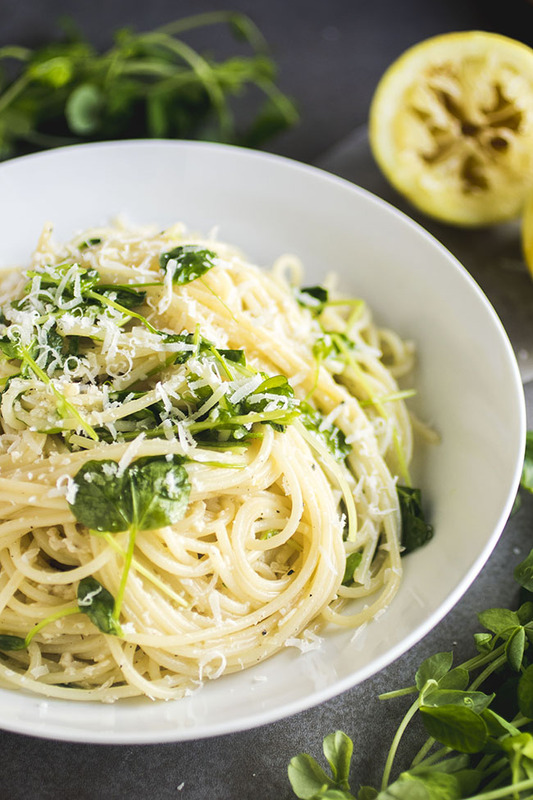 This spaghetti gets tossed in the world’s easiest lemon parmesan sauce – olive oil, parm, lemon, salt and pepper, BOOM – and mixed with some gorgeous, sound-way-fancier-than-they-actually-are spring pea shoots. (For bonus fancypants points, you can call them tennnnndrils in your snootiest foodie accent). 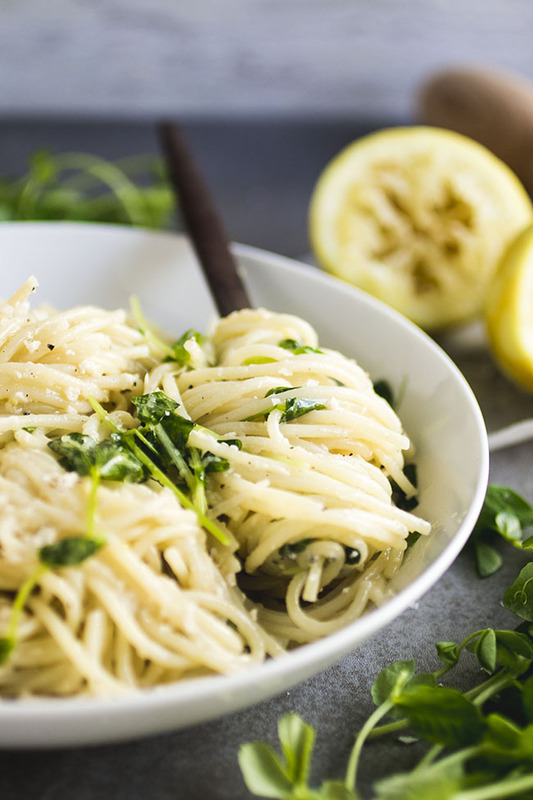 I’m of the opinion that pea shoots and tennnnndrils are some of the most underrated-slash-delicious things ever, so when I found some at the grocery store the other day (CUE HAPPY DANCE) I just knew I had to put them in a bit of fresh, bright, lemon-y pasta. Also, HI, HELLO, can we talk for one second about how ridiculous it is that I can already find fresh pea shoots at the store because that means it is already basically summertime and wheeeeeeere has this year gone??? I swear that just yesterday I was making New Year’s resolutions I had no real intention of sticking to. PS – If you haven’t had pea shoots before, you need to jump on this STAT. They have a short season from late spring to early summer and are the sweet, micro-green-esque leaves of a pea plant. Pea shoots have a slight pea flavor and are amazing in salad, pasta, stir-fry, pesto, you name it! Also, the stems are edible and not at all bitter if you buy them towards the beginning of the season, so you don’t need to worry about any fancy leaf-pulling or culinary stem gimmicks. Just throw them whole into all.of.the.things. and then give yourself a high five for being awesome. You can also swap out the pea shoots for whatever you have handy – use fresh peas, broccoli, bell peppers, or herbs for some color and serve with grilled chicken or wild salmon for a heartier meal. SO MANY POSSIBILITIES! Strict vegetarians should use a vegetarian parmesan cheese here (one made without rennet). Don’t use pre-shredded cheese in this recipe!!! 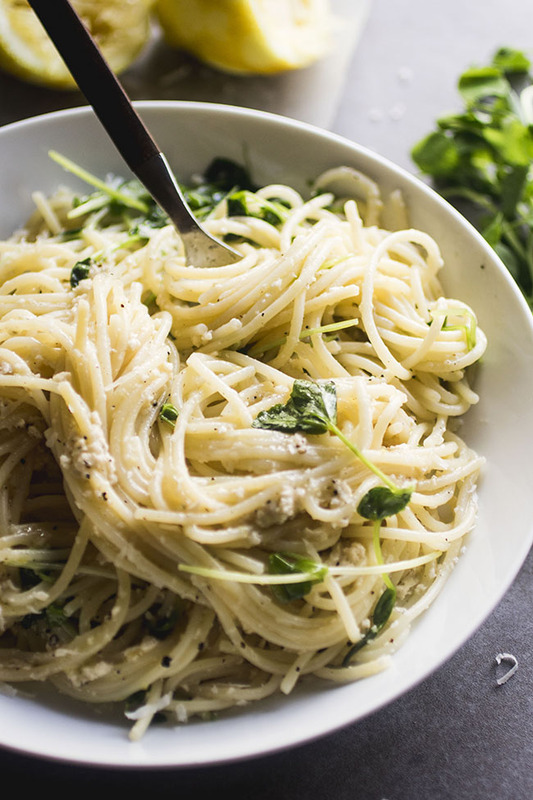 Most store-bought shredded parmesan is treated with preservatives that prevent it from melting smoothly, and you’ll end up with a clumpy mess instead of a smooth sauce. 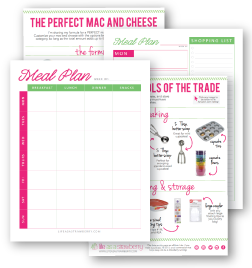 For best results, buy a block of parmesano reggiano cheese (AKA “real” parmesan cheese) and grate it yourself with a microplane or the small side of a box grater. 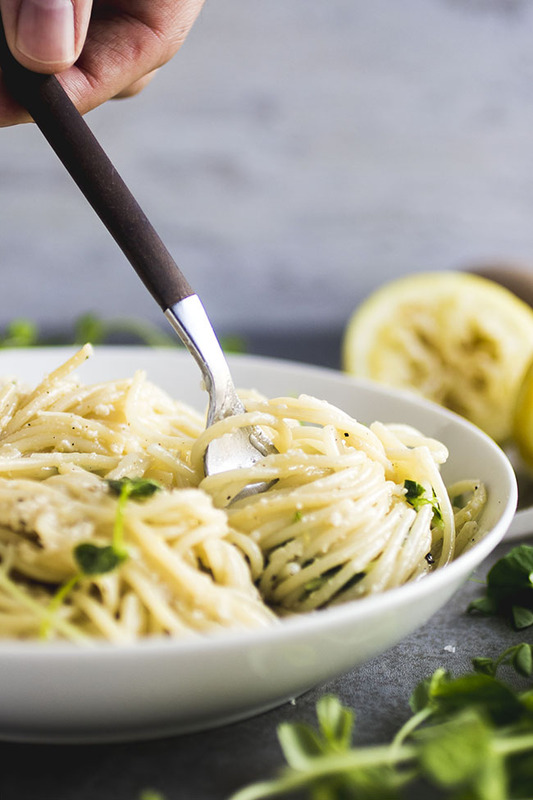 Use a good quality olive oil in this recipe – because there are so few ingredients, the quality here really makes a difference! Use PLENTY of fresh ground black pepper in this recipe, and don’t be afraid to add an extra pinch of kosher salt to bring out the flavors. When you’re working with so few ingredients, proper seasoning is everything – so don’t forget to taste your pasta before you serve it and add salt and pepper as necessary! You can grow your own pea shoots! Plant ordinary dried peas (not parboiled!) in compost, water, and wait 10 days. You can do them on the windowsill – spring food all year round. Just got a bag of pea shoots from my produce delivery and I was trying to find a pasta to make with them and this came up! I had all the ingredients and it was sooo delicious!! I’m so happy you liked it! This recipe has become one of our favorites. Thanks for letting me know how it turned out!